Tapping into a gusher isn’t the only way to strike it rich in Texas. Joe T. Smith Inc., Hawley, Texas, has been in business since 1936, offering oil-drilling customers 24-hour service for field-related jobs such as saltwater disposal. For the past 30 years, the company has used a Model 6V Brill oil-recovery system from Oil Skimmers Inc. to recover up to 25 barrels of oil a day from its saltwater disposal pit. According to president Hoss Smith, sales of the skimmed oil comprise 40% of the company’s revenues from recovered oil. chemicals (VOCs). These VOCs are not only an important and valuable part of the oil, but they enter the air as greenhouse gases as they evaporate. If the oil remains in the saltwater pumped from the pit into a porous-rock disposal well, it can clog the formation, reducing the effectiveness and life of the well. Allowing the oil to degrade reduces its value to refineries. SOLUTION: Cleveland-based Oil Skimmers Inc. Model 6V oil skimmer is an affordable and long-lasting solution for recovering residual oil from saltwater pits and tanks. Hoss said Joe T. Smith uses its Model 6V continuously on its 500,000-gallon pit, and the only maintenance the skimmer has required in 30 years is normal parts replacement. Prevents evaporation of VOCs, which makes Joe T. Smith Inc. a more environmentally responsible company. Extends the life of and reduces the maintenance needs of the disposal well. 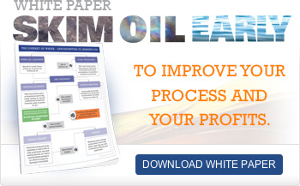 Oil quality is preserved, which results in a higher sales price for the recovered oil, thus paying for the skimming equipment in a short period of time. The Model 6V utilizes a unique floating-tube system. The closed-loop tube – made of flexible, specially formulated plastic – attracts oil but not water. The unit continuously draws the oil-covered tube through scrapers (which remove the oil) and returns the clean tube to the water surface to gather more oil.